With Fabio Capello's boys about to take on the might of Egypt this week, here's a tragic reminder that not all of England's followers are hale and hearty with anticipation. 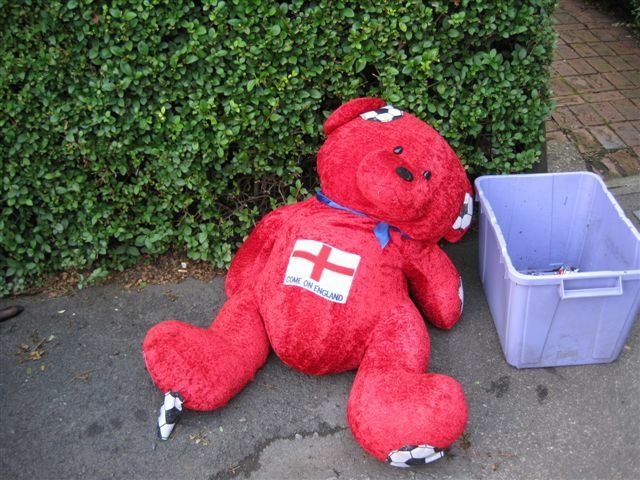 This sorry figure was pictured slumped near a Wimbledon driveway by reader Julian Chung. It's yet another example of London's growing problem with vagrant bears. This poor fellow has lost all semblance of ursine dignity. With the very pads of his paws rotting away, he slips in and out of an alcohol-induced, privet-propped stupor. His sole companion in these final, horrific days is a stinking recycling bucket of periwinkle hue lined with three servings of bear vomit. The only shooting this erstwhile footy fan will be doing from now on will probably involve a heroin needle. The neglect has to be stopped - if only the mainstream press would take an interest. In the meantime, keep sending us evidence of teddy bear (or other soft toy) abandonment on the streets of London to tips - at - londonist.com.